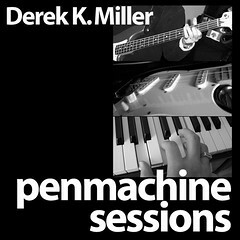 This is "Penmachine.com: November 2004," a page that archives an entire month's entries from my online journal. The latest material for that month is at the top. For my newest entries, visit the home page. Cool. Especially the prints and posters. Darren Barefoot posted some useful points on improving your weblog, if you have one (or writing one well, if you're just starting). The ensuing conversation in his comments has some good back-and-forth as well. I like: "Don't confuse passion with complaining. [...] If you're going to complain a lot, make sure you're very amusing doing so." Also, if you're a woman with long hair and are considering cutting it short, go read the post from Peechie that Darren links to—it gives you a decent lowdown on how to go about it. If you're a man with long hair and you've really gotten used to the length, the article might help you too, but men are generally a lot less stressed about lopping off big hunks of hair than women are. At least it seems that way, if the participants on "What Not to Wear" are any indication. One of my bandmates, Adam Woodall, has posted a short summary of his recent travels in India and Nepal on his own website. A short and interesting read. I think I spoke some sort of curse when I mentioned the dependability of my friend Sebastien's Matchless guitar amplifier a couple of days ago. Today when I tried setting his amp up, the power socket, which has been wobbly for years, popped a wire off. The amp is now extremely buzzy, and rather dangerous because it isn't electrically grounded. Fortunately, it's a problem that can be solved with a soldering iron, and a cheap replacement socket if we want to be daring. The technology behind the Matchless is decades old: it doesn't even have any circuit boards in it, just tubes and components and wires and switches and such. Rugged, and easy to repair, even for a relative un-handyman like me, just like the guitar that plugs into it. There's something to be said for keeping the ancient in some technology. Britain's Daily Telegraph lists the 50 greatest cover songs of the rock era. (Many will be unfamiliar to North American audiences.) Overall, it's a better list than the Rolling Stone top 500, and it's hard to argue with the #1 cover version (which is also #48 on the RS list). Sebastien, the guitarist in my band, has been playing the same Matchless DC-30 combo guitar amplifier for more than 10 years (it's on the left in this photo from 2002, and this one from 1994). It was extremely expensive when he bought it new—worth more than any car any of us had back in those poor days—but the investment was worth it. He's never replaced the vaccum tubes that power the amp. The electrical cord connector has been wobbly for years. The amp has been shipped to Australia and back. After that, it was stolen and then found a year later. These days, it travels from storage to show and back again, over and over, with no maintenance whatsoever. And it continues to sound absolutely amazing. Here's why it puts up with the abuse: Matchless amps are built like tanks, with the best possible components and classic, hand-wired designs. Other than the impossible-to-find and even more expensive Dumble amps used by the likes of Stevie Ray Vaughan and Carlos Santana, I've never heard a better tone or seen more rugged performance from a guitar rig. Many others agree. 2004 holiday digital camera guide from DCRP. Speculation on why Americans make good software and movies, but bad cities and cars. Tim Bray: "Exactly the same forces that are driving the world to open data in general and XML in particular are driving us towards open source." I thought this article was an off-time April Fool's joke or a reprint from The Onion , but it seems like it's an actual Wired News report. It's still surreal. Danny Goodman is apparently a well-respected guy, but I have to wonder: if the advice in his book Spam Wars is so good, wouldn't it be a far better public service to simply make it available online for free than to restrict its audience just to those willing to spend money on it? How can anyone expect to help "choke off the [spam] economy" without telling everyone how to do it? Information Week : "Firefox 1.0 offers everything most people need to browse the Web [and] is the first Web browser since October, 1997, that deserves serious consideration by the entire world of desktop computer users. [It] offers everything most people need to browse the Web, in a way you're apt to like better than Internet Explorer." It's a good thing scientific theories aren't evaluated by public opinion. The key to making money as a writer or editor, I think, is that you need to sell out to the Man. I mean that a bit tongue-in-cheek, but it's true. When people come into freelance writing or editing work, we tend to think of the obvious or glamorous: magazine articles, mass-market fiction and non-fiction books, and other high-profile creative works. But that's not where the money is. Last week at the Editors' Association of Canada meeting here in Vancouver, speechwriter Colin Moorehouse argued that, as a freelance writer or editor, it is quite possible to make a comfortable living, even a lot of money. Many people in the audience were skeptical, because their experience has been that it's a hardscrabble existence. Moorehouse writes speeches for big corporate, government, and institutional clients. His work is often completely anonymous, and while he can name some of the organizations he's worked for, he can't say specifically who spoke his words and when. But he makes quite a bit of money. My experience is similar, and not just in writing and editing. My most lucrative contracts have been writing and editing instruction manuals, website material, newsletters, and other corporate communications materials where no one reading the results knows my name, or perhaps even considers that someone has to write the stuff. Here's another example. Last night, I played with my band at a private event in a big ballroom at the Hotel Vancouver, for the annual year-end party for a company I'd never heard of before we started doing this event several years ago. Compared to the drudgery of driving around the province in a cheap van playing at crappy bars ten years ago, these shows are a dream: they're in town, start and end relatively early in the evening, pay extremely well (sometimes more in one night than I'd make in three weeks in the old days), and include a dressing room and buffet dinner. Too often, those of us who work in creative fields think that working for big organizations—for government, for large private and public institutions, for corporations—is out of our league, or even beneath us in some way. If you're in this kind of work out of principle, that's fine. But if you want to support yourself and your family, remember that the Man is a person too, and needs your help if you work to find him. Well, it turns out that while http://sisyphean.org/ works, http://www.sisyphean.org/ doesn't, and I'd been tacking the www on there. Silly me. Actually, silly him too. It's a strange historical thing, but people (me included) expect that a site's address will work either with or without the www. Maybe this little mention will prod him to fix it. Hint hint. People will find web pages not by clicking in a way designers imagine in classic web design but by choosing the pages they find on your site through search, syndication and aggregation. Don't try to control eyeballs and try to envision click paths. ...create compelling content constantly. Compared to getting ripped off by SEO companies, the money commitment of a blog is small. And yes it takes time, but [...] the time commitment is crucial and becoming more crucial every day. I agree, because a useful website is one people want to visit. Now, Roland is a bit of an idealist, because it doesn't just "take time"—creating compelling things for people to look at on your website, constantly, can eat up a lot of time. It can consume hours each day if you let it, so you have to make sure you don't neglect other parts of your business that are more important. It is very tempting to simply pay someone else to take care of web stuff. But over time spending that money becomes less and less useful, I think. I am generally unaffiliated with the act in question, but I do know him, and the guy who plays bass on the CDs also often plays bass with me too. P.S. One of the albums is available at the iTunes Store, if you're in the U.S.A.
Local author and writing instructor Crawford Kilian has posted a wonderful essay on global English, in which he talks about how the Web, contradictorily, helps both homogenize and diversify the English language. If you're interested in the topic, I recommend a (printed) book that pre-dates the Web by about six years: The Story of English . It was a companion to a 1986 U.S. PBS series of the same name, and provides a wonderful, thorough, and easy-to-read overview of the evolution and spread of English around the world. The references to technical English and some of the regional dialects (particularly of South Africa and, sadly, Sierra Leone) seem a bit dated, but overall it has aged well, and discusses many of Kilian's topics in some detail. Today we forget that, even a little more than a hundred years ago, English was still an also-ran language, and that only the rise of American influence through the 20th century cemented it as the leading tongue of world discussion. In Shakespeare's time, English was still very obscure and essentially confined to those rainy islands off the north coast of Europe. French, Spanish, German, Russian, and other languages all exerted more influence over the subsequent centuries. Nothing guarantees that English will persist, either. Chinese is surely moving up fast. I've subtly remixed two of my free songs, "Cold Cloth and an Ice Pack" and "Gronk Patrol." Most of the work was just to bring them to a similar volume with the other tracks—"Cold Cloth" was too loud, and "Gronk" too soft—but I've also made a few level and equalization adjustments. I think they sound better, so please download them again if you want to. I just discovered the website of the British music-recording magazine Sound on Sound , which has article archives reaching back into the 1980s. They have an interesting approach: in addition to subscribing to the print version, you can get an "eSub" that lets you read new material on the website—otherwise you have to wait eight months or so to see it online. An interview with leading mixing engineer Bob Clearmountain. A three part history of the Korg synthesizer company. Reviews of the Vox Valvetronix guitar amplifier, the new $30,000 "cloned" Hammond B3 organ reissue, the (sadly) now-discontinued Kawai MP9500 digital piano and its predecessor the MP9000, and the Apple Power Mac G5. A mid-'90s interview/review of the careers of synth pioneers Tangerine Dream. A workshop on using multi-band compression effects. And I only found this site yesterday. Lots to read—if you're into music recording or performance, then go look. The figures—both physically and statistically—back this up. Mean portion size in Philadelphia was about 25 per cent greater than in Paris. Philadelphia's Chinese restaurants served 72 per cent more than the Parisian ones. A supermarket soft drink in the U.S. was 52 per cent larger, a hotdog 63 per cent larger, a carton of yoghurt 82 per cent larger. More pointedly, the French usually eat three set meals, more often at home or shared at a table with others, and those meals are made from fresher ingredients. They also don't usually eat snacks. Anyway: less food = less weight gain. QED. This month, the popularity of my digital piano article from last year has spiked. Dozens (and maybe hundreds) of people come here every day to read it. I am not a piano player, though my daughter is well on the way to becoming one, but I wrote there about my experiences finding her an instrument, and a year later the page remains high on Google's results list for "digital piano." It is a pity that so many searches for common terms lead to sites that want to sell you something, so I'm glad to do my part. At work, I've been stealing other people's iCurve laptop stands when they're out of the office. Perhaps to stop me from doing that, the company just bought me one. It's very nice, as far as functional inert hunks of plastic go. More fun is the bright orange Cabinet Sanchez t-shirt Bill got for me. It's a very in-joke for those who read Spamusement. That site, run by Panic Software's Steven Frank, posts a daily cartoon based on real spam subject lines. This particular cartoon came from the subject line "you were wrong cabinet sanchez." And now I have him on a shirt. Olé! Why can't everyone get it? The other day, Kevin and I were talking about why Mac computers and software just "feel" better to use than most of their Windows (and Linux) counterparts. He was asking why no one has taken something like NetNewsWire and simply ported the whole experience over to Windows, where it could sell a lot more copies because no similar program on that platform works quite as well. I think John Siracusa and John Gruber, two of the finest writers on the Mac side of the Web (whether named John or not), explain the situation handily as this: in the small market of Mac software and hardware, there is intense peer pressure to be great, not just good enough. Mac users have come to learn to care about the entire experience of using Macs and Mac software, and since there aren't as many of us, products that don't meet those expectations can't survive. I'm pointing these things [meticulous detail even in the installation of a particular program] out not because Delicious Monster is unique among Mac developers in the quality of their artwork and their attention to detail, but because they aren't unique. Nearly every popular Mac OS X application is a single-icon drag-installed affair, sporting an attractive icon, distributed in either an internet-enabled or meticulously decorated and arranged disk image. Even open source applications like Fire and multi-platform ports like Mozilla meet this standard on OS X. Heck, even Real gets it right. Real software...think about that! [This] is an example of the best kind of peer pressure. There is simply a "climate of excellence" on the Mac platform. Any developer that does not live up to community standards is looked down upon, or even shunned. Commercial, open source, freeware, shareware, it doesn't matter: pay attention to detail, or else. We all benefit from the fact that the Mac community has zero tolerance for vulnerabilities. Not just zero tolerance for security exploits, but zero tolerance for vulnerabilities. In fact, there is zero tolerance in the Mac community for crapware of any kind. If some "freeware" software for the Mac surreptitiously installed some sort of adware/spyware/crapware, there'd be reports all over the Mac web within days. Uninstallation instructions would be posted (and thus made available to all via Google), and the developer who shipped the app would be excoriated. 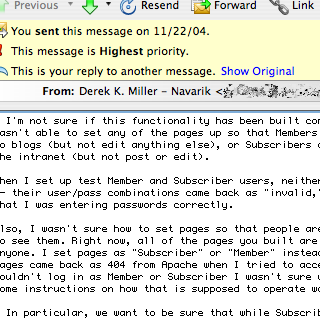 Zero tolerance, on the part of the user community, is the only policy that can work. It's similar to the "broken windows" theory of urban decay, which holds that if a single window is left unrepaired in a building, in fairly short order, the remaining windows in the building will be broken. So: expect greatness, and don't tolerate crap. Most users of Windows and Linux don't expect a great user experience (not the kind we're talking about here, anyway), and do tolerate crap of various kinds. We still have un-great products on the Mac, and there is still crap, but the difference is that Mac users want, expect, and will work to make both go away. This doesn't make people who use Windows or Linux dumb or ignorant, of course—it just means that their minds are on other things, whether just doing their work at the office or working with the technical guts of their operating system. Groove on V: "Fresh Snow in the Valley"
After posting "Gronk Patrol" a couple of days ago, I decided to finish an another, older track I'd had sitting around for awhile. So here is another free song: "Fresh Snow in the Valley." It features high-gain feedback lead guitar, an echoey riff, techno bass and drum loops, random electronic noises, and funky breakdowns. The tune has a lot of layers, so you might want to listen to it with some headphones that have good bass response. GarageBand, which I used to record it, doesn't offer a lot in the way of real-time stereo panning control, but I managed to fake some, so you'll get the full trippy effect with some good cans on. Incidentally, if you, like me, are the sort who wants to share music you create with others, download CC Publisher and CC Lookup from Creative Commons. They're applications that let you embed legal sharing licenses in your media files and automatically upload them for free hosting, as well as examine files you download for license information. The Economist provides the best overview of the current state of the recorded music industry I've read in a long time. The Incredibles , which my kids and I saw last night, shows once again that Pixar seems incapable of making a bad movie. Directed by Brad Bird, who also made the excellent Iron Giant for Warner Bros. five years ago, this is a computer-animated movie for slightly older kids. My four-year-old wanted to go home, then fell asleep (some bits drag if you're not that interested in dialogue, and others are a little scary)—even though it was her idea to go—while my six-year-old and I both liked it a lot. If you're the type who doesn't want to expose your kids to violence and death (though that's never stopped kids from finding out), this isn't your Pixar film. There's nothing graphic, but somehow having actual "people" (often henchmen) blown up or sucked into jet engines is different than having bugs ( A Bug's Life ) or fish ( Finding Nemo ) eaten by birds or barracudas. Yet because of that, the action is more vital and exciting than anything in any recent James Bond or Vin Diesel movie. The small indie band Ghosts of Pasha recently had a lame Sunday night show in New York turned into a fabulous, packed mosh-fest by a group of performance artists. It's a pretty cool stunt, and it doesn't hurt that their music is pretty decent. I know the feeling they had—in 1995, I was in a band called The Flu, and we took out a loan to travel to the Melbourne Music Festival in Australia. We started out with hardly any audience at empty clubs, and three weeks later had groups of people driving two hours to watch us play in Bendigo, far inland from the city. Then we got back to Vancouver and did a brief tour of Alberta, where nobody knew who we were. A few months later, the band broke up. But having fans sure was fun. Groove on IV: "Gronk Patrol"
The latest addition to my page of free songs to download, play, and share is one I just completed, "Gronk Patrol." I call it a "spacey twang instrumental"—one that started out as an accident. You should also soon be able to check it out over at MacJams, along with my other tracks, which are already there. Some strangely risqué stuff going on there too. Rather than stressing over the election contest across the border last night, I went with a friend and his father-in-law to see Team America: World Police , which seemed an appropriate film for the occasion. Then I came home, looked at the numbers, cracked a beer (something I rarely do—Canadian beer, by the way), and went to bed, to find things hadn't changed for the better overnight. With high voter turnout and a majority of both the popular vote and the electoral college, George W. Bush's victory in yesterday's U.S. election may be narrow, but it is clear. Most American voters looked back at the past four years and decided that Bush is, on balance, leading them where they want to go. I think most of us outside the U.S.A., and many within, looking back at the same four years, don't understand that decision at all. Late last night, Dori and Tom in California wrote that "We feel that we no longer recognize our country." For me, it's like seeing an old friend turn from vibrant and friendly to cold and bitter—and (finally, belatedly, woefully) being able to acknowledge the change, because of how hard and unwelcoming their face has become. I hope now that the next four years, and the years after that, are better than I fear they might be.